My first idea for and attempt at making Homemade Tater Tots turned out great. Then I tried them a second time…just to be sure. Even better. All six of us were so excited! These look like a tater tot, feel like a tater tot and well (if I do say so myself) taste better than a tater tot (funny thing about fresh potatoes and healthy oil). My idea was to try the homemade hashbrown trick. Remember, I bake the potato, let it cool, shred it, then cook up the shredded potatoes into hashbrowns. 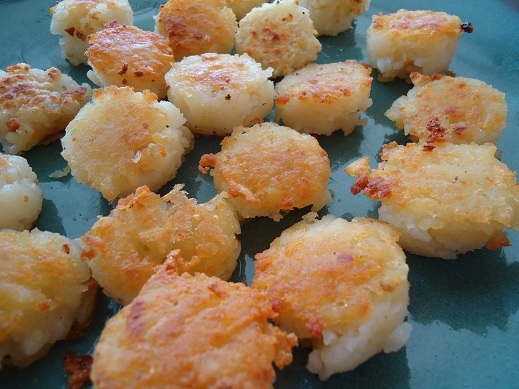 SUCH a fabulous and easy way to make nice hashbrowns. And now…Tater Tots!!!!!! First, scrub and bake your potatoes. Allow the potatoes to cool. Peel the potatoes (and save the skins to make Potato Skins as described in Katie’s Healthy Snacks to Go ebook!). Chop the peeled and cooled potatoes and throw them in a food processor to shred finely. I’d recommend using the “pulse” setting if you have one. You don’t want your potatoes to turn to mush. Well, maybe you do, but I don’t. with a cheese grater…it’ll just take a bit longer. And be careful to keep your fingers away from the grater. You don’t want fingers in your tater tots. Well, maybe you do, but I don’t. Next, heat some oil in a skillet (medium heat). You just need enough oil to barely cover the bottom of the skillet. You don’t want greasy tots. Well, maybe you do, but I don’t. Use a small cookie scoop and pack in the shredded potatoes to make a nice firm ball. (If you don’t really pack it in, the potatoes will just fall apart when you place the ball in the skillet.) Gently set the ball into the skillet. Allow it to cook thoroughly on one side before carefully turning it over. Press the ball down slightly when you turn it. Each side takes about 3-4 minutes to cook. Remove tater tots once they look nice and crispy and golden brown. You don’t want blackened tater tots. Well, maybe you do, but I don’t. Sprinkle with desired amount of sea salt. 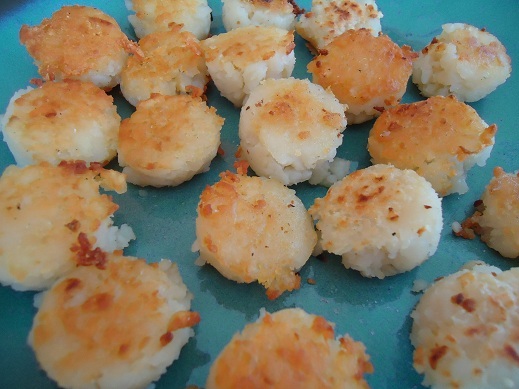 You should eat these right away because you don’t want cold tater tots. Well, (say it with me now) maybe you do, but I don’t. If you can possibly keep your family out of them…we discovered that these freeze and reheat very well!! We used our toaster oven to reheat some leftover tater tots a day or two after I initially made them, just to test and see if these can be made ahead of time and YAY…it can be done!! Just for fun, you may also want to check out the Homemade Tater Tot recipe at Finding Joy in my Kitchen. She came up with a different way of making tater tots that looks pretty tasty! Overall, I’d say making Homemade Tater Tots is easy. Is it as easy as opening up a package and throwing the contents onto a cookie sheet? No. But it sure doesn’t take a lot of effort overall. And then, if you make several batches and freeze some…you’ve got easy, healthy tater tots ready to reheat for a quick side dish or snack!! Okay…one recipe down…fourteen to go. Unless you count all the other ideas you challenged me with. Now, go bake some potatoes so you can hurry up and make some tots. You don’t want to miss out on the delicious taste of fresh, Homemade Tater Tots. Well, maybe you do, but I don’t. This recipe looks tasty but just isn’t for me. Why bother with the extra step when you could have lovely fried hashbrowns instead? But I know tater tots are a big thing in certain parts of the country, just not where I am from. I’ve never had a tater tot casserole. One look at the ingredient list is enough motivation for most people. I add low fat parmesan cheese and tiny bits of meat and form them into actual taters….soooooo good..family favourite! I am sooooo excited to try this one! My hubby and son love tater tots and I hate buying the ones in the store that have icky stuff in them. I will test this one out tomorrow and freeze some for my family that’s coming to visit in a couple days. Thanks Laura!! I tried chopping them up into tiny pieces like the store bought ones in hopes my hubby would be more open to them . . . It didn’t work too well, I didn’t have a scoop so it was hard to get them to stay together. I wound up making patties out of them and I thought they were great! Hubby said “they taste . . . . Fresh” lol he isn’t too into “fresh” foods but at least he will try the things I’ve been making now. And just like that, I can die a happy woman. I am so making those tomorrow. Thank you so much! My husband loves tater tots, but I don’t like feeding the family all those ingredients that are listed on a package of them. I will definitely have to try this out and I’m sharing this page with friends who feel the same way I do about the ingredient lists on packaged tater tots! Ah! I just told my husband I was going to figure out how to make these and here they are! Thank you for posting this. I wasn’t even sure where to start. My husband will be so excited for these. They look like the crispy crowns, which my husband prefers over tater tots. Thanks for the recipe! I loved this!! Thanks for sharing! I just made a tater tot casserole with organic tater tots. I promise, it’s a southern thing. This might be a way to cut down on the expense of organic ones. Thanks! Those look so good! I think I could just eat them right through the screen!!! I can’t wait to try these. My husband always wants to buy a huge bag of tater tots at Sam’s and always suggests having them with this or that. I haven’t told him that I can’t stand them!!! But these look wonderful. My potatoes are baking right now! Can’t wait to try these!! Does the brand of coconut oil that you use taste really ‘coconutty’? I bought some from a healthfood store, but it made the cookies I made taste like coconut(which I hate). I have some LouAnn brand in my pantry that I have used that does not make things taste like that, but I don’t know how healthy it is. I use Tropical Traditions coconut oil, but there are two different varieties and two different tastes. The virgin coconut oil tastes like coconuts. BUT the expeller pressed does not. I use virgin oil when I want a coconuty taste (like in muffins or brownies) but if I’m frying something, I use expeller pressed since it doesn’t have a flavor. I feel that it is actually flavorless, but still with the nutritional value! for my peanut/tree nut allergic child to use. My son is allergic to peanut/tree nut. Tropical Traditions is one of the few brands we can use. I contacted the company and their oils are packaged in a peanut/tree nut free facility. when it was deemed “tree-nut, I asked the allergist and he said that as long as he’s never had any problems don’t worry about it. had other food allergies in the past. These look so yummy! I have a question though…I like to eat baked potatoes ….but when I bake my potatoes, they’re soft inside. How long do you bake yours so that they’re not mashy inside? I guess I’m thinking that if I were to bake them, they wouldn’t grate very well…what am I missing here?! Can’t wait to try! My guess is that you need to bake them longer. The longer I bake them, the more moist they are, instead of mushy. I bake them for at least an hour and a half…sometimes turning off the oven after that time and leaving them inside to moisten more. Then, to grate them, they really need to be pretty well cooled off. potatoes to get them to shred nicely. Otherwise, they turned to mush. I found 1 hr and 15 minutes worked out about right. russet is going to grate better than a smoother Yukon Gold. What fun! These would be great in the freezer for the kids to pull out for lunch. I’m glad you had success with frying them. My attempts at fying them failed. I ended up breading them with corn flake crumbs or with panko bread crumbs and then baking them. 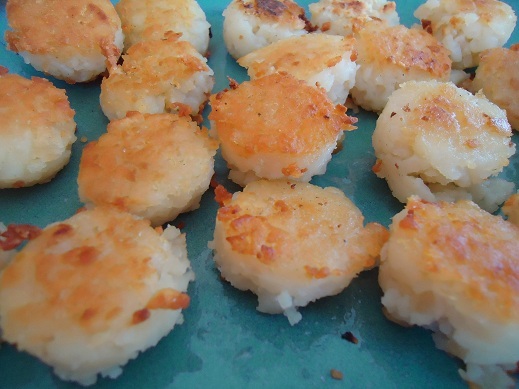 I am going to make these for the freezer when I find a good buy on potatoes. Thnx for sharing. Here’s an experiment for you to try with your next batch Laura. Add 1/2 to 1 teaspoon of finely minced onion to the mixture when you are ready to make the balls. My mother worked in the lab at a potato and veg processing plant when I was a kid. For awhile they produced tater tots with onion in them. They were so good! I’m happy to get your recipe because I can try to bring that childhood favorite back for my family! Thanks! I always make extra baked potatoes when I bake them, just in case I have unexpected company for dinner. I can use the tatertot recipe scoop them into balls then into freezer bags, when I have enough for a meal get them out fry/bake them like the convenience store kind. I am so excited you posted this! I resisted the urge to purchase frozen tator tots when I went to the store yesterday, and I came here today to find a recipe..perfect timing! I’ll be making these this week. I am not a tator tot fan per se, but the fam is. These look delicious. However, I’m trying to watch my carbs so I’m going to attempt making something similar with grated cauliflower… Thanks for the how-to! So excited! This is one of my preganancy cravings and I am so happy to have an inexpensive and healthy alternative! Just made them! Sooooo good and easy! Wow… quick and EASY! Two ingredients… my kind of recipe! I need to find a reason to make these tomorrow! THANK YOU. I’ve been splurging on organic tator tots, but this is a much more cost effective solution. Oh my gosh you’re awesome! I love tater tots and a healthy version sounds wonderful. I made these on Saturday and they were a hit! I don’t have a cookie scoop, so I used a measuring spoon instead (the Tbsp one). Worked ok, but I forgot to pack the taters in tight for the first batch so it was more like hashbrowns. Second batch was much better! thanks for helping me find another way to use up potatoes before they go bad! Made these today and they turned out well. Two questions though. 1. Is my coconut oil suppose to dissapear as I fry the tator tots? 2. Why wouldn’t you just use mashed potatoes instead and put them in little balls? I guess like a potato cake but in a ball. I also will be looking to use some type of seasoning because even though I enjoy these the kids are going to tell me they are a little bland. Thanks for your recipes they are great. Thanks, Laura. I’ve been thinking about how I could freeze potatoes while I can get organic ones. This will be perfect. I’m wondering how the cauliflower worked for one of the commentors and if it would work to mix the 2 together. Laura, We FINALLY got around to this tonight (but way after dinner so it ended up being a tiny snack). I just experimented with one baked potato left over in the refrigerator. The dc and I loved it. I’m guilt-ridden though because I totally forgot to save one for dh to try! We’ll be making the rest tomorrow. Thanks for the recipe. I was wondering if these could be baked instead of fried? I’ve been trying to bake everything instead of frying. I can’t say for sure because I haven’t tried it. I think it might work, as long as you put some coconut or palm oil on your baking sheet and turn them a few times while baking. I would be sure to add some oil to the baking dish or add something to make them crunchy on the outside. Otherwise they probably will turn to mush. Hi there — I made some but just today looked and your directions and found out I did it a little differently. 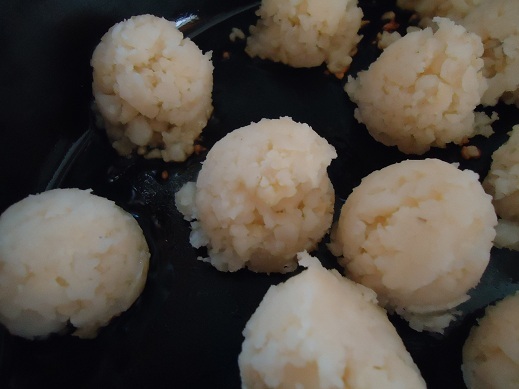 I baked, shredded, put into balls and then froze, planning to just drop them onto hot oil (like a tot out of the grocery bag LOL) and cook them LATER. Have you tried this? Looks like you cook up in the oil and THEN freeze/reheat. I tried these but was too lazy to fry them all. I spritzed a mini muffin tin with some oil, scooped the taters into the cups, mushed down to pack, and baked at 425 for about 20 mins, then flipped over on a cookie sheet and baked 15 mins more. They were great. Dude! This is the first, of several recipes, that I read…and i laughed my _ off. Thanks for the tots & laughs, I enjoyed both (maybe they didn’t, but I did). Made these..fried them a little too long…but everybody still loved them. Will do again. Thanks for the great idea. 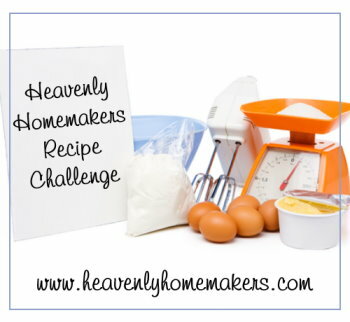 Sooo many more recipes to try…this is going to be fun!!!! Do you fry then freeze them? I did a trial batch and they are oh so good!!!! Yes, I believe it would work to fry then freeze them. Think you can use red potatoes instead of russet? I just did this with a whole bunch of random potatoes I had laying around Russet, baby reds, and sweet potatoes! 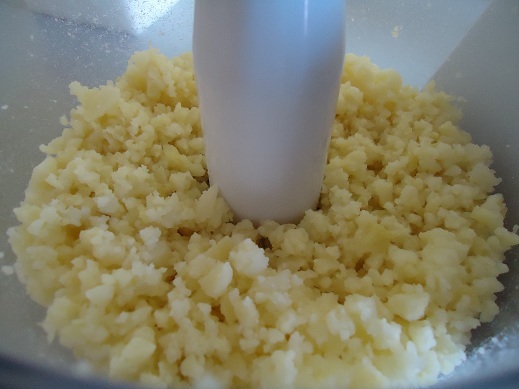 My kids had a great time mashing the potatoes instead of grating (it took a long time, but entertained them while I got the rest of the kitchen ready) coconut oil is the best thing ever! Thank you for such a great and simple recipe. You could even cook the potatoes in the instant pot. I do this for mashed potatoes. Just less time.